When I was growing up, one of the most popular PC games was Wolfenstein 3D. It was a great first-person shooter in general, but let’s be honest, there was one reason that everyone really loved it: The goal was to kill Nazis. Fast forward to this year, one of the most popular movies in 2009 has been Quentin Tarantino’s Inglourious Basterds. It’s a great movie in general, but again, let’s be honest: People love it because it’s about killing Nazis. And a new iPhone game follows in this timeless tradition. 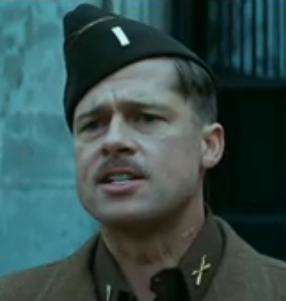 In Inglourious Basterds, Brad Pitt’s character, Lt. Aldo Raine, gives a speech to the group of soliders he’s recruiting for a special mission: “Each and every man under my command owes me one hundred Nazi scalps. And I want my scalps. And all y’all will git me one hundred Nazi scalps, taken from the heads of one hundred dead Nazis. Or you will die tryin’.” The speech is the driving force behind 100 Nazi Scalps, a new side-scrolling iPhone game that has just gone live in the App Store. The goal is very simple: Collect 100 Nazi scalps before you are killed. Using an array of different weapons, you must kill the Nazis coming at you, and use either a knife or a club to take their scalps once they’re dead. Morbid? Sure. But remember, these are Nazis. And Apple, which is famously cautious letting certain types of content into the App Store (well, sort of), apparently had absolutely no problem letting this game in (with a 17+ rating). Oddly enough, it looks like Apple has pulled the Mein Kampf app that it previously made available. Meanwhile, it was actually a piece of content related to Inglorious Basterds that contributed to Someecards app originally being rejected. 100 Nazi Scalps creators also don’t shy away from the fact that the game is clearly influenced by Tarantino’s movie. In an email, they write, “This quality side-scrolling arcade game was inspired by a long-expected movie by Tarantino ‘Inglorious Bustards’. And although it is not affiliated with the movie, provides its fully own characters and unique plot, the game immerses players in that “killing Nazis” atmosphere so popular these days.” Fair enough. And though there isn’t much to the game, it seems well worth the $0.99 price to get 5 full levels of Nazi killing. Find 100 Nazi Scalps here in the App Store. By the way, if you’re interested in more Nazi-killing fare, Wolfenstein 3D is also available in the App Store in its full FPS glory. See 100 Nazi Scalps in action in the video below (if you don’t like cartoon violence, then the video is NSFW).